I have a large number of original valve stems used on T's, and many of them need the threads cleaned up. These are not the big ones that the repro boys are vulcanizing to tubes now, but the ones they actually used way back. I think the threads may be metric. Does anyone know what size die I would need for this? Larry,if you go buy a tire core removal tool,the correct tap and die are built right into it. Both for the tread on outside and inside of the stem. 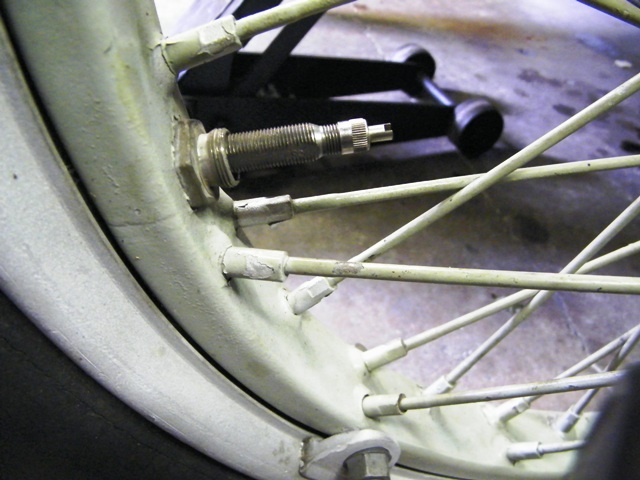 Original metal tire tube stems were 10 or 12 mm depending on period and application. Sorry I don't know the thread count but believe the file would have what you need and do either diameter. You most of the modern stuff is junk that will not interchange with originals. I'm going to be pulling off that wheel with the original valve stem on my trailer next week while I'm on vac. I'll give you a call and set up a time to get together. Been busy and haven't had a chance to get at it. Sorry. There are several different sizes. So it depends upon which one you are using. I think some of them may be a "National Extra Fine" or NEF thread. These threads were sometimes used in electronic and electrical applications. I have a couple special taps left over from that previous life, but none that match valve stems. After Christmas I could check a couple of the valve stems I can find (I have nearly a dozen I can't find and it is driving me crazy(er)). Otherwise, carefully measure the stem and use a thread gauge or count per inch very carefully (many people over-count by one). Then you can check with specialty machinist tool suppliers. It has surprised me in the past what they had on the shelf. Like Jack Daron says, there's a tool for valve stems with chasers for cleaning up the threads on the inside and outside of the stem. If your auto parts store doesn't carry them, your local bicycle shop definitely will. Otherwise, they can be purchased online. 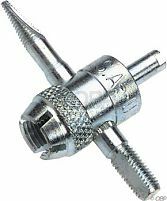 After posting the tool above, I realized you are probably talking about the threads along the stem that are for the lock nut, rim washer and dust cap so the above tool is not what you need. Do take on Wayne advice and figure out what you do have before trying a die chase. It is generally accepted that they were usually metric...but on a few I've done to salvage an old stem I have sometimes had to machine the rim nut to have but one thread. Apparently the diameter is the same for whatever an odd ball thread is but the thread pitch is sometimes different. I just checked a couple of NOS valve stems I have, and the thread diameter is .396-.400", with 28 TPI. Perhaps after breakfast, I'll get out my machinist handbook and see what I can find. Those auto parts store tools are not what I was talking about! From my chart it looks like 1/8" Whitworth Pipe Thread. If you, or anyone else, emails me, I'll send you an excel file of every known screw thread standard. It's a great resource. If the tool Eric shows is correct and you can't find it try a bicycle shop. (if there are any left)! with both being 55 degree thread angle. Is your XL chart titled "A Compilation of Thread Size Information" ? complete listing of thread sizes to an xl file, and thought it had some info on tire valve threads. as �Dunlop�, and only covered the following sizes. Yes, that's what my chart is entitled. Larry, according to the Ford prints, up through 1920, two different sized stems were used, one for the front and one for the rear. The front stem's large diameter was 13/32" x 28 tpi and the small diameter was 5/16 x 32. This was used only on the front (30 x 3) tire until late in 1920. The rear (30 x 3-1/2") stem was different. Its large diameter was 15/32" x 26 tpi and the small diameter was 15/16 x 32 tpi. This stem was obsoleted on 11-18-20 and from then on, only the first stem was used, on all tires. R.V. - What is the correct length for the valve stems? The "front" (later, all tires) is 3-1/8" overall, and the "rear" (obsoleted in 1920) is 3-17/32". Leave it to RV to find the trivia. I'm not interested in the early thread sizes, and they are going to be pretty hard to find. I just want to know the STANDARD thread size that Schrader and DILL used. I'm assuming that the 13/32-28 would probably be correct? I have a whole box of those tire valves, and they are all 28 TPI. Larry, the correct term is "minutae," not trivia. The drawing of the stem that became standard on all tube sizes doesn't specify, but the extant drawing of the cover, which is threaded, states that "This is the design for "Schrader, Firestone, and Dill." Therefore, I think it's more than safe to say that the drawn stem and its specs would have been standard. Do you mean the Dill brand valve cover/ caps with the sliding threaded piece with-in? The sliding piece has the same thread as the valve cap on all valve stems. Are there other types of Dill branded valve covers without the internal sliding piece? The information in this thread is great. RV - might you be able to share some information about the valve stem dust covers which were originally installed on the early (under 3,500) 1909 Model T's? Thanks in advance for whatever you might be able to share. I would if I had any. I didn't find any drawings for the valve stem part numbers dated earlier than 1916, and no releases at all. However, quite often the early parts' numbers were changed, so if I dig around I might find something this summer. Since these were supplied to rather than made by Ford, there may not be anything. I meant to say "valve stem COVER part numbers."